The highlands of APPI sit right next to the Towada-Hachimantai National Park in northeast Honshu. Each winter season amazing powder covers all of APPI. The 21 trails at APPI are easily and comfortably accessible by an eight-person gondola and three high-speed, detachable, hooded quad chairs. 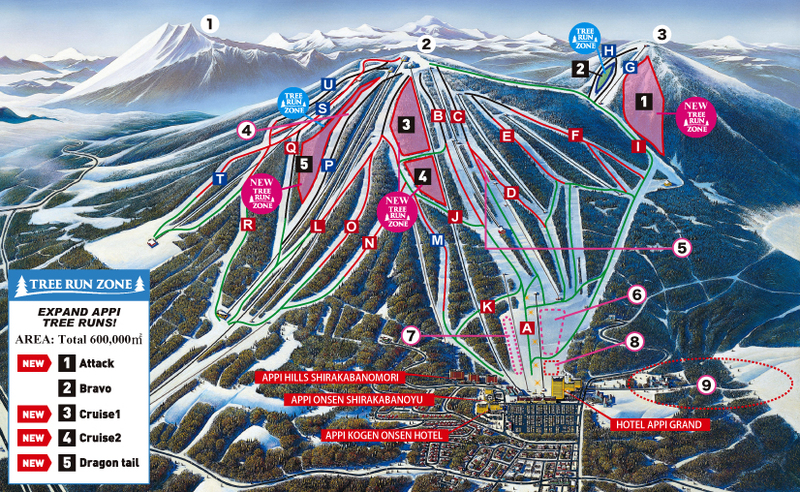 There's also a lot of variety at APPI Kogen - from beginner bunny slopes to a 5.5-km (3.4-mi) cruiser to steep and deep! APPI is one of the most well-known resorts in Japan and continues to be a mecca for skiers and boarders alike. Come see why by yourself. Facilities at the ski resort include full rental services, a ski and snowboard school that offers lessons in English, various nature experiences, a snow park, the APPI Happy Snowpark, a kids room and much more.. with other facilities available in the hotels in the base area. APPI has expanded the tree run zone from 5 hectares to around 60 hectares for 2018-2019 and there are now 5 areas to challenge - 'Bravo', 'Cruise 1' and 'Cruise 2', 'Dragon Tail', and if you are an advanced skier or snowboarder don't miss the most difficult area 'Attack' which is located in Mt. Nishimori. Enjoy the pleasure of being flapped by Premium Powder Snow! The longest run of 5500m from the peak of Mt.Maemori to the Shirakaba terrain. Enjoyable run even during early and late season. Long slope continuing to sailer base of the mountain. Open and even slope with intermediate difficulty. This run leads from Second Slopes to Sailer Long Run. It is enjoyable with medium to gentle slopes. Ungroomed slope on the far-east side of the mountains. 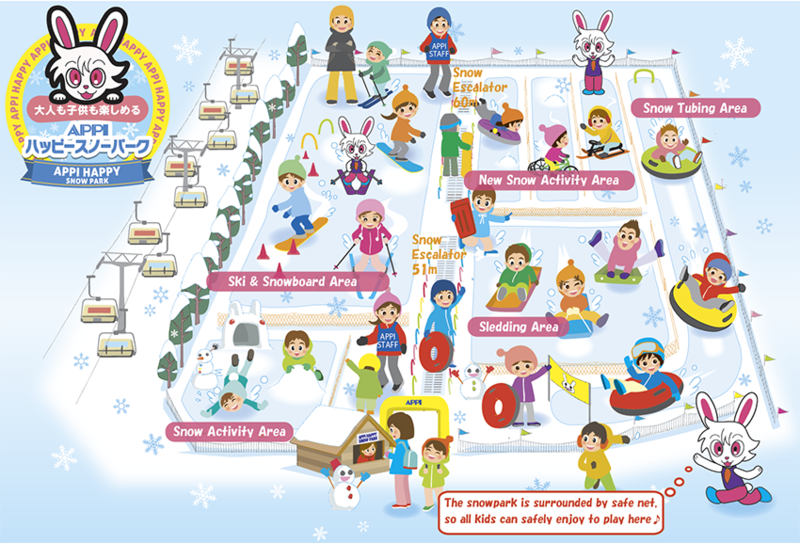 The Happy Snowpark has been renewed with new snow activities! The spaces is wider and it's safe and perfectly suited for young beginners! Kids and families can enjoy playing in the snow with more toys and items, as well as sledding. Ages 0-6 are free, but children must ride the lifts and gondola with a guardian. Children age 6 who attend elementary school pay the Children rate. Advanced reservations must be made by 5pm the day before. At this resort there is a maximum ski run length of 2,700 meters, a maximum gradient slope of 37 degrees, a vertical drop of 550 meters, 1 triple lift and 2 pair lifts. This area is suitable for intermediate/advanced-level skiers and for those who like to enjoy fresh snow. Hachimantai backcountry has one of the best Japanese powder on offer. Newly open from January to March 2019. The luxurious custom snowcat accommodates a maximum of 8 guests and 2 guides in warmth and comfort for an unforgettable day of cat skiing and snowboarding. Our knowledgeable guide will highlight the best of Hachimantai mountain. While staying in APPI, you can have a trip to Hachimantai rural town to experience local restaurants and/or shopping at supermarket at night. 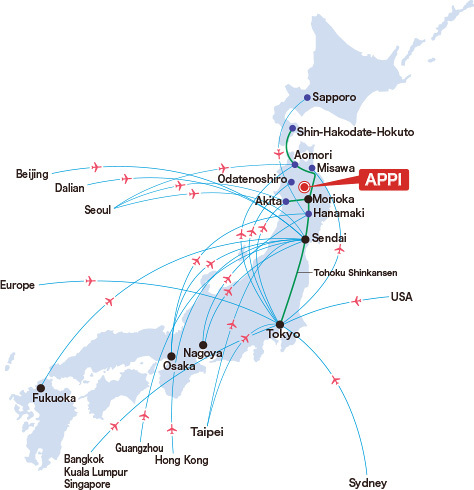 APPI is located on the centre of Northern Tohoku region and is in latitude 40° N where world's famous ski resorts such as Austria's Arlberg and USA's Aspen are located. Here is the access information so that you can come to APPI by Japan Rail, Air, Bus and Rental Car. Please take a look for the following access examples from foreign countries during APPI Winter Season. * If you take JR Hanawa Line from Morioka Station, there is FREE shuttle bus between JR APPI Kogen Station and the resort buildings. **The shuttle bus in APPI resort do not run for early morning and late night trains, please contact appi_english@ihr.co.jp or call your hotel to organise pick-up.